Six drugstore options to keep your feet cool this Spring/Summer. So I have feet that feel uncomfortably hot, especially in the night, and are extremely dry and warm all day. I get up many times to reapply foot lotion because they are burning hot, despite the room temperature set at 17C. No, it's not hormonal, it is there all the time and I have inherited it. And it ruins my already non-existent sleep. This Spring/Summer, I am determined to break the pattern, keep my feet cool and hydrated at all times and get some decent sleep. I have stalked the drugstore aisles - offline and online - to come up with six products that are keeping my feet from boiling up. Best Summer foot cream ever. I can bathe in a vat of this lightweight blue gel. Smells pleasant; does not grease the sheets or hosiery. I have already used up half the tube, but I'll be hitting Boots for backup in June. A Boots exclusive - buy here. This is heavy-duty and not cooling as such but I'm mentioning it here for those days when your feet feel extra dry and need a bigger dose of moisture. Just £5.50 for 125ml (currency variations may apply), this is available in most Boots and some Sephora outlets. Buy it here. Instant air-conditioning for the feet with each spray. The crackling is fun. The downside? Effects don't last too long and you have to reapply. But the cooling more than makes up for it, effectively calming blazingly uncomfortable feet in a second. Buy it here. If I wear these mask-socks at night, I can get solid sleep without my feet feeling warm even once. There are separate socks for the left foot and the right foot in each pack, and there's also a tape to see the sock doesn't slip off at night. Each pack costs just $4.86. Buy it here. This spray is very watery and runny. The packaging is slightly different in different countries, but the cooling effect is the same, believe me. Just don't spray it on a minute before wearing expensive leather shoes. I buy everything Freeman from my local drugstore but it is on the ubiquitous Amazon. This thing is just $3.79. You are going to need a LOT of soothing in the warmer months, so why not pick something competitively priced? I first apply Boots Cooling Foot Gel, whether it is day or night. At night, I follow up with Heel Genius. 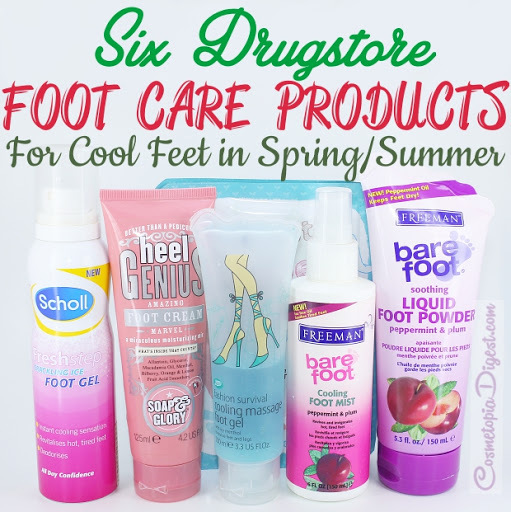 The Freeman Foot Mist and Scholl's Cracking Ice Foot Gel are for reapplications through the day and night. The Shara Shara foot masks are used every few days, and followed up with the Boots Cooling foot gel. How do you keep your feet cool in the heat? Tell me in the Disqus comments widget below.